When you install Honey for Chrome, this pop-up window appears. 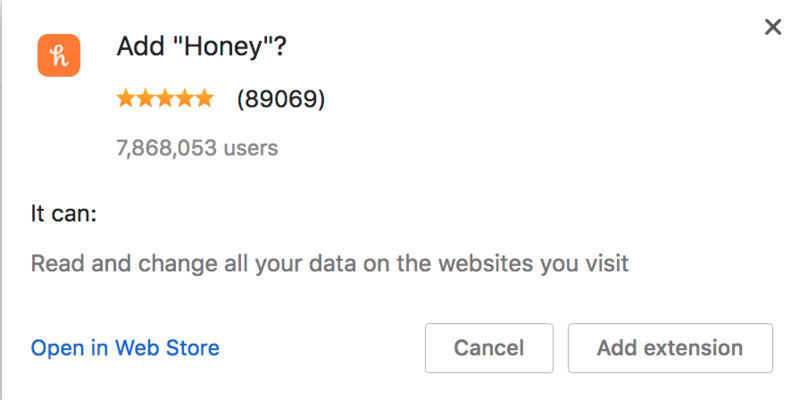 The best way to determine if an extension is legitimate is to see how it has been reviewed, including the amount of users and its rating. We currently have over almost eight million users and a five-star rating in our Chrome Store reviews! If you still don't feel comfortable using the extension, you can create a Honey account and use the coupon codes we provide while you're logged in at JoinHoney.com. Questions about privacy and user data? Please contact us directly.